There’s just something about planes and space shuttles that capture the imaginations of almost every child. Want to blow their minds? 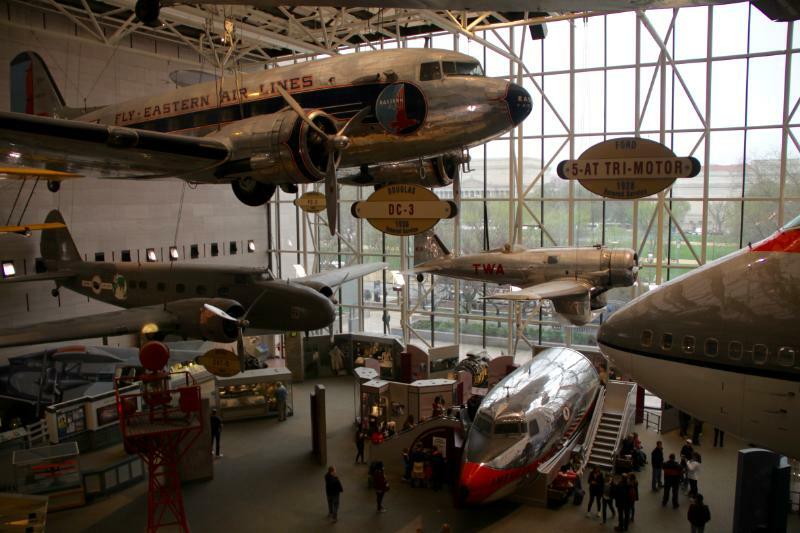 Visit the National Air and Space Museum (NASM) in Washington, D.C., a Smithsonian institution. It contains the world’s largest, most comprehensive collection of historic aircraft and spacecraft, comprised of thousands of objects on display. One of the most visited museums on the globe, this spacious glass and steel building is brimming with famous flight-related artifacts – such as the 1903 Wright Flyer and Charles Lindbergh’s Spirit of St. Louis. Inside the Air and Space Museum in Washington D.C. Photo Credit: Sarah Cody. When my son was a toddler, he was captivated by “all-things-aviation”. In fact, he walked around clutching four toy planes, which each had a distinct name and narrative. At bedtime, he rested on a bed festooned with images of flight. Now, a decade later, he couldn’t wait to walk into the National Air and Space Museum during a recent family road trip to our nation’s capital. Centrally located on the National Mall, this museum is quite a spectacle. The open two-story layout features an abundance of actual aircraft – sitting on the floor, hanging from the ceiling. The collection includes uniforms, engines, manuscripts and pictures. Stroll through exhibits, such as Apollo to the Moon, detailing America’s maiden voyage to the moon in 1969. America by Air is highlighted by a Boeing 747 nose that visitors can enter as they explore the history of commercial aviation air transportation. Our boys, ages 10 and 12, also loved the cockpit simulation of an Airbus A320. Folks can touch an actual lunar rock at the Milestones of Flight gallery. In addition to the exhibition galleries, visitors should check out the Albert Einstein Planetarium, the Lockheed Martin IMAX Theater and the Public Observatory where families can gaze at the moon or planets through telescopes. 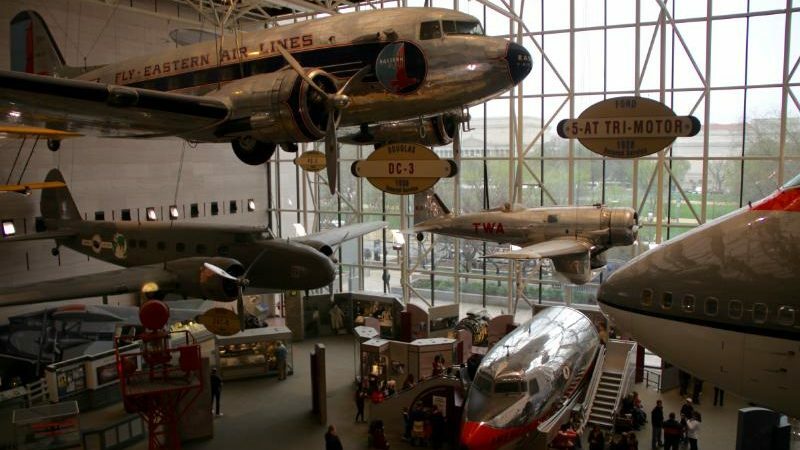 The National Air and Space Museum is considered by some to be the most popular museum in Washington, D.C., a city that’s chock full of history and culture. 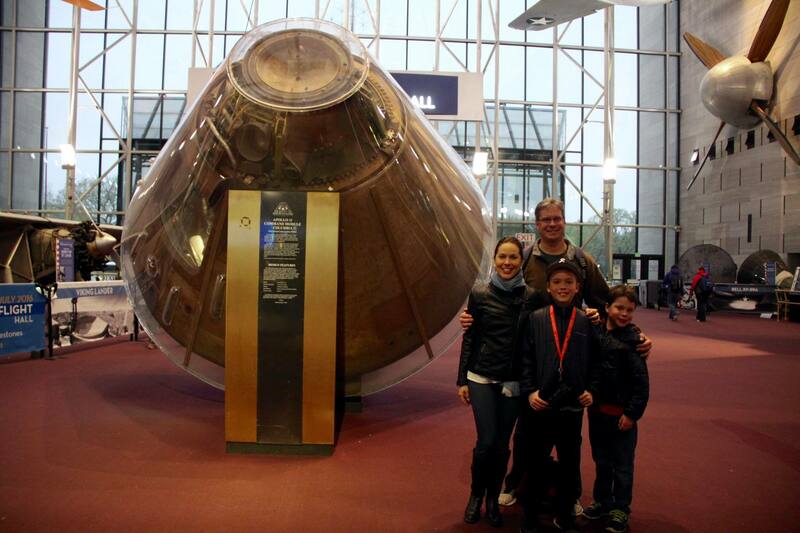 For a family pic, we stood in front of the Apollo 11 Command Module Columbia which housed astronauts Neil Armstrong, Edwin “Buzz” Aldrin and Michael Collins. Like most museums in Washington, D.C., admission is free. The museum is open every day except December 25th. We arrived in the late afternoon during a school vacation week and walked right in – no wait at all. The public can either peruse the exhibits themselves or partake in daily tours, appropriate for families with children ages 2 through 8. Educational activities, such as science demonstrations and story times, are also often available. 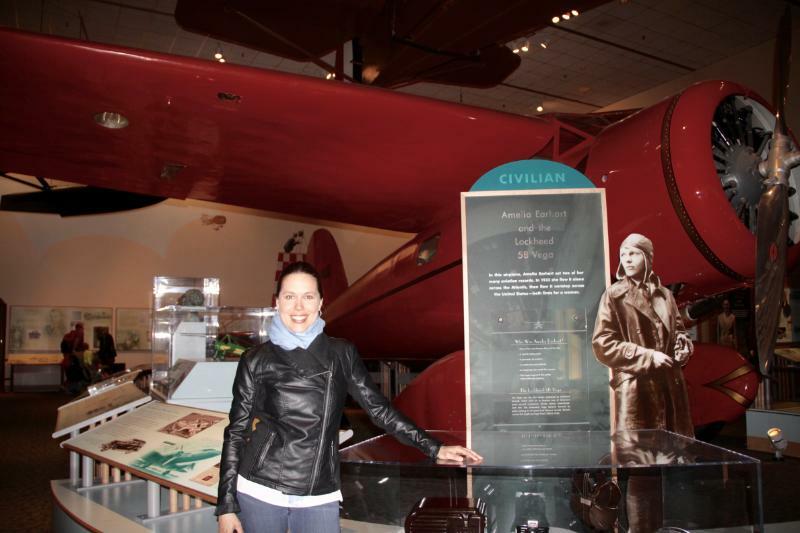 I became the excited kid when we stumbled upon the Amelia Earhart exhibit. The female aviation pioneer – and her mysteriously tragic story – have always fascinated me. Earhart’s red Lockheed 5B Vega is on display at the museum. It’s the plane that helped her become the first woman to fly non-stop alone across the Atlantic Ocean in 1932. I really enjoyed seeing the plane and reading all about this brave, modern woman who disappeared while flying in 1937. Our mission is always to enjoy each other’s company while learning new, fun facts to discuss. We laughed and chatted a lot while sampling the museum’s flight simulators. We experienced the Cosmic Coaster, an exhilarating ride through space. Another option allows visitors to control the action – and partake in barrel rolls – on combat sorties. There’s also a SpaceWalk where folks can ride aboard a space shuttle and tour the International Space Station. There’s no denying it, my boys love video games and these simulators aptly mix technology and adventure to create a very cool educational experience. In the age of apps and web sites, I relied on a good ole’ book as I planned our vacation. The DK Eyewitness Travel Family Guide to Washington, D.C. didn’t let me down. Doing some research ahead of time will make any trip to this bustling city a little bit easier. In addition to the National Air and Space Museum, we visited the National Museum of Natural History, took an absolutely awesome tour of the Capitol, and strolled around the fabulous National Zoological Park. We also took part in a bike tour of the monuments – spending time at the monuments dedicated to Abraham Lincoln, George Washington, Franklin D. Roosevelt, Martin Luther King, Jr. and Thomas Jefferson while also getting some exercise. Next visit to D.C.? We must see the Newseum, the International Spy Museum and the U.S. Holocaust Memorial Museum. You simply cannot visit D.C. too much! 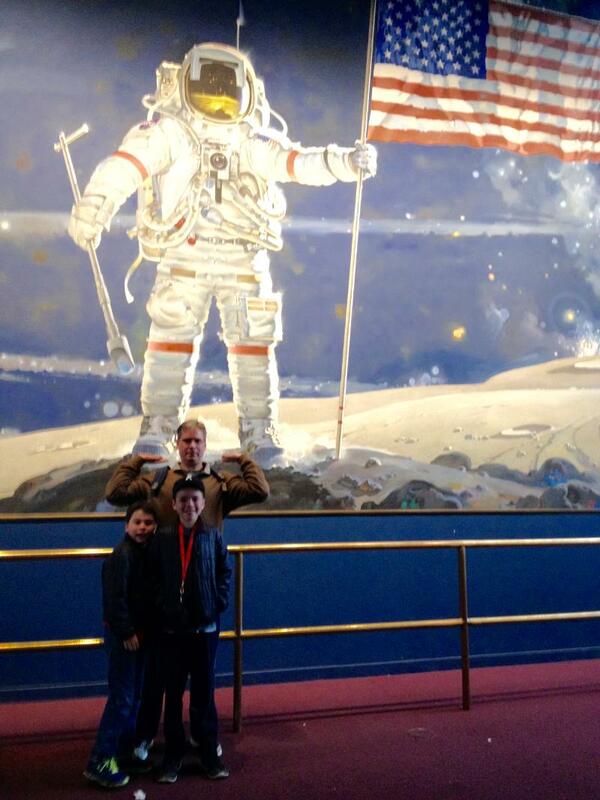 But, no matter where else we go, our visit to the National Air and Space Museum will continue to resonate with us due to incredible sights, sounds and opportunities for family bonding. WANT ANOTHER SUGGESTION FOR A DESTINATION THAT WILL SATISFY ANY AVIATION BUFF? Admire your mission to “enjoy each other’s company.” Looks like you picked a great Museum. 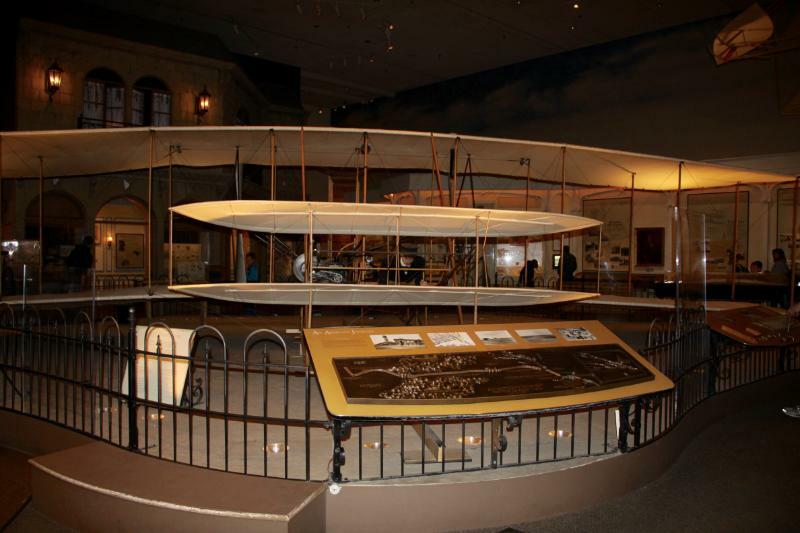 The Air and Space was one of our favorites… Seeing the Wright brothers plane all the way to the Mars Rover gave us a great perspective on progress and innovation! D.C. Ha long been a favorite vacation spot for our family. We visited the National Air and Space Museum but due to the crowds, and a toddler in a stroller, we didn’t quite make it to all the key exhibits. Thanks for reminding us to put this on our list for a re-visit! I feel like I was there with the writer and her family! 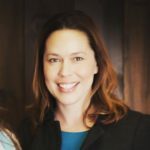 This article inspired me to take our family to DC!